The search for a hallway table is on! Affectionately called the "not-an-entryway" table, we are looking to add a table to the start of our long hallway that leads to the bedrooms. Not-an-entryway table because I originally thought after seeing the apartment that it could go in between the front door and the coat closet. Then we moved in and I realized I sorely misjudged the amount of space (its more like 12 inches). So, the idea for a table to hold keys and decorative items moved to the hallway but it was definitely far down on the list of apartment needs. Hence, we are coming up on our 1 year anniversary of living here and it still hasn't been added to the decor! A few months ago our need for a hallway table grew a bit more pressing. With no really good spot for our kitties' litterbox in the house, it found its home in the hallway. Being able to put it underneath a table would at least hide it a bit from view when you are heading around the corner. I also like the idea of finding a thrift store/Marshall's mirror to hang above the table, basically doubling the perceived length of the hallway. Depending on the quality of the mirror, there may be the opportunity for some painting and additional DIY action. Trolling Craigslist has not come up with much. 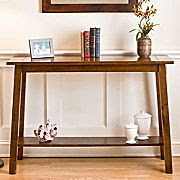 The challenge is that the table cannot be as long as a typical sofa table as the hallway is only 42" wide. It also can't have anything in between the legs as the litterbox will have to fit underneath (either sideways or facing front as we have it now). That means the extra shelf on the bottom that I would have loved to stack some inspiring coffee table books on is out of the question. Here's one from JC Penney I liked. Clean simple lines like this one from Crate and Barrel are also pretty attractive - the price and I aren't getting along, but it is simple tables like this that lead to believe Bob and I can make one ourselves. . .
We found such a table browsing through JC Penney.com the other day and will start to figure out if building it to our needed measurements is plausible this weekend. It may involve metal tubing and will definitely include multiple trips to Home Depot! I am not being coy by not sharing the photo of the table we plan on re-creating. I saved the photo to my work computer which I don't have with me right now. Am glad I did save it because it seems to have disappeared from the JC Penney Web site overnight! It must have been too good a deal for everyone to pass up (50% off meant the table was only $109 - if we didn't have this in mind for a good DIY project, I'm sure we would have been fine plunking down that much cash!) And so, you will just have to believe me when I say the table definitely fits our style and we are going to have some fun trying to build it! If you want to see our minimal history with furniture re-dos, check out the coffee table we "made" here! Also, check out this console table DIY from Design Sponge - I saw this a few months ago and this helped get us thinking about building the table ourselves.